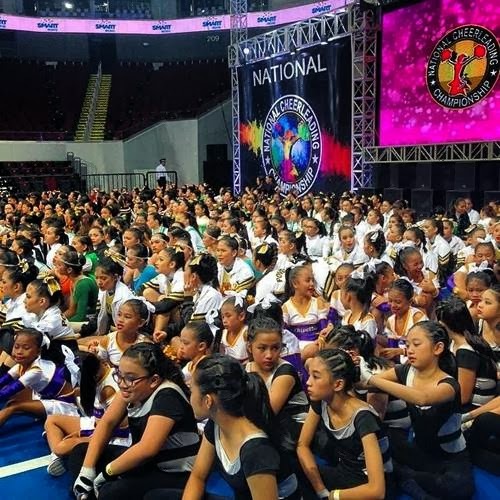 Facing stiff competition from top cheering schools from all over the country, two South Cotabato cheering squads emerged as big winners in the recently concluded 2014 National Cheerleading Championship (NCC) held at SM Mall of Asia Arena in Pasay City from March 8-9, 2014. For third straight year, Lamba Central Elementary School's pep squad called Chipettes successfully defended their title and once again declared as Champion in the Peewee Division of this year's NCC Finals. Lamba Central ES is located in Brgy. Lamba, Banga, South Cotabato. Meanwhile, last year's National Cheerleading Championship 5th placer in the High School Co-ed Division - the Saravia National High School Eagles from Brgy. Saravia in the City of Koronadal leveled up and placed second in this year's competition. First place went to Immaculate Concepcion Academy and a cheer team from Lanao del Norte placed third. Notre Dame of Dadiangas University's Sarimanok Pep Squad from General Santos City also successfully defended its title in the College Coed Hiphop Division. University of the East's Extreme Squad came in second and Taguig City University won the third place.